This post is for anyone who wants to get ahead. It's for anyone who wants to stop reacting to and floating through life day by day, hoping for the best. It's for anyone with much to accomplish and little time to do it. This post is for anyone who wants to focus and thrive, yet finds themselves distracted and unsure of what to do next. 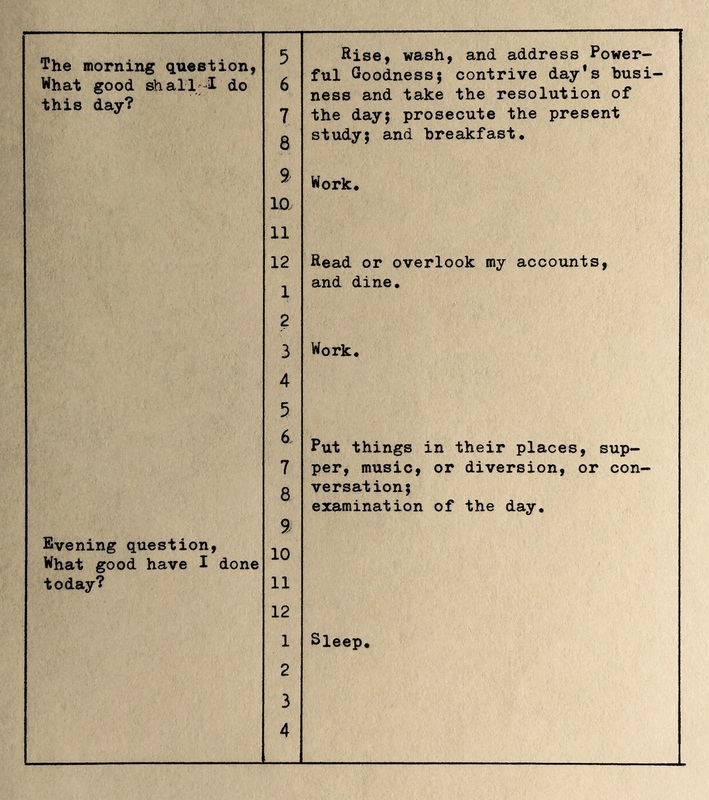 An example of Ben Franklin's daily schedule... planning out each hour of his day along with a few questions to inspire his own personal development. What I'm about to outline is a method for planning that will give you an edge on your day, helping you prioritize that which is most important. Like Benjamin Franklin, who intentionally designed his day with a daily schedule, we can build ourselves a successful life one day at a time. Taking 10 minutes today to create a plan for tomorrow will give you a head start, keep you on task, boost your productivity, make the most of your meetings (even those useless, recurring, unavoidable ones), and help you accomplish more. Many of us have tried different tools for getting more out of our day: waking early, installing apps to track "time wasters", setting focus timers and taking frequent breaks, etc. While useful, and despite using them religiously, most mornings start slow. We sip coffee in a groggy state, unsure of where to begin our day, gravitating towards braindead tasks like email or web surfing. Distracted by the dozens of unexpected emails and phone calls, and never finding quite enough time to start those important long-term projects, we close up shop feeling unproductive and unsure of what was accomplished. The source of these problems is usually the lack of a plan. We plan projects, weddings, vacations, and trips to the grocery store, but for some reason never feel the need to plan our day. Sure, we schedule meetings and have a thought or two regarding what we might do, but mostly we freestyle, like a DJ playing a set of unfamiliar records. If we had a basic plan for those times, if we had a high level understanding of how we would use each hour in our day, we would go to bed having accomplished so much more. The most successful people in the world have a plan. Not just a plan for big projects, but a plan for the little periods of time that they know will add up in the long run. When you are done reading this post, you will know how to develop a plan tonight that will guide you tomorrow. You will be able extract maximum value out of each and every hour of your day. Your plan will guide you when distracted and, in the early hours of the morning when your willpower is low and it’s difficult to think, it will provide you with a goal to kickstart your day and accomplish something while the rest of the world is still waking up. Creating your plan is not complicated... it is as simple as filling out an index card. At the end of each day, we will create a plan for tomorrow… filling out a small (index-sized) paper card with our appointments, free time, todo list, what we are going to accomplish first, and things we should keep in mind throughout the day. Planning each day may sound time consuming, but using our format is dead-simple and takes no more than 10 minutes. This card and these 10 minutes are the key to our productivity. It’s a simple, extremely effective way to get a jumpstart, to accomplish more, and to stay focused throughout your day. The format is simple. Grab an index card and write tomorrow’s date at the top. From top to bottom, list the hours of the day. I like to start with “early morning”, then 9am, 10am, and so on, ending at 7pm and finally “evening.” Below that write “Tomorrow's Todo’s” and leave a few blank lines. Your card will end up looking something like the card seen in this picture. An example planning card accounting for each hour in your day plus a list of todo's. The card itself usually takes less than a minute to draw up and less than 10 minutes to fill out, but the productivity benefits huge. Filling the time slots on your card is the first important exercise. While doing this, think in advance about how your day will flow and find ways to make your down-time productive. I like to start by looking at my digital calendar and transferring those meetings over to the card. Doing so may seem wastefully duplicative, but this is a chance to jot down any notes about the meeting that come to mind. Going into a meeting without understanding what you want to get out of it is a recipe for failure, and this simple step can do wonders to making your meetings more successful. Benjamin Franklin himself once said “By failing to prepare, you are preparing to fail." Once your meetings are written down, unfilled hours will stare at you with contempt. Do not let them. Those are the hours you have been filling with meaningless labor—unnecessarily checking email, surfing the web, etc. These are the hours you are going to stuff with useful tasks. Leave no hour untouched… once your plan is crammed from morning to evening you will sleep easy knowing that, even if you do not accomplish everything, what you have done will have far exceeded your output on any given day prior. With a full day ahead, you may have some actions that do not properly fit on the calendar. Note those in the “Todo Tomorrow” section of your planning card at the bottom. Many days, you will find these todo’s are unfinished actions from your previous day. On other days, they are simply random tasks that come to mind, great for filling in free periods of time should they arise. Finally, flip your planning card over. We will use the back for two very important sections: “First Things First” and “Keep in Mind”. First Things First is where you list the very first task you will work on. You do not have to finish… you just have to spend some time on it. This is perhaps the most important way to kick off your day. Having already thought about how your day will start and what you will do, it will give you a huge head start. Once you get through this first task, the rest of the day will come easy. Keep in Mind is where you will list a few important reminders. These can be personal goals, affirmations, meditations, prayers, birthdays for friends and family, or anything else you want to remind yourself of throughout your day. Glancing at this every so often can help keep you grounded, be inspiring, or simply remind you to do something important. Leave the card on your desk, “first-things-first” side up, staring at you first thing in the morning. You will want to start this task immediately. Leaving it in plain sight the night before keeps you accountable to your plan. Keep the plan on you at all times. It’s a small card, so should fit nicely in your pocket… in between your cell phone and wallet. At the very least, leave the card on your desk in plain sight. You will find yourself looking to it when you lose focus, cannot figure out what to do next, or just need to glance at your next appointment. The most successful people in the world have a plan—a plan for the little periods of time that they know will add up in the long run. Developing a plan tonight to guide you tomorrow will jump start your day. You will be able extract maximum value out of each and every hour. Your plan will guide you when distracted and, in the early hours of the morning when your willpower is low, it will provide you with a goal to kickstart your day and accomplish something while the rest of the world is still waking up. We would love to hear from you. Let us know in the comments below how this post has helped you become more productive, or if you have modified the planning card and created a format of your own!